Longtime Lathrop Homes resident Pecola Doggett (left) held a string of temporary and seasonal jobs until she got hired at Costco at Clybourn and Damen avenues. Photo by Ryan Jacobs. When Costco finally agreed to move into a vacant property site between Damen and Clybourn avenues in 2000, it meant much more than low warehouse prices for local shoppers. The decision marked the end of a six-year battle between low-income residents of the adjacent Lathrop Homes and the City of Chicago. The process began in the mid-1990s at a community meeting near Hamlin Park when former 32nd Ward Alderman Terry Gabinski and real estate developer Ron Shipka Sr. announced a plan for a community that would require rezoning the former commercial site to build a lavish 500-unit condominium complex. Liala Beukema, pastor at the Church of Good News, was working with the Logan Square Neighborhood Association to organize a group of congregants and residents to lobby the city to abandon the project. The group met with city representatives for months but made little headway. At the suggestion of allies at the Local Economic and Employment Council, Beukema decided to take an alternative route and schedule a meeting with the head of Vienna Beef. The longtime Chicago manufacturer was located directly across the river from the condo site. Vienna Beef CEO Jim Bodman accepted the meeting and agreed that complaints about noise and smells from upscale condo residents would create problems for his factory. As a steward of the employee-friendly company, Bodman also saw merit in Beukema’s goals. Following their meeting, he notified Mayor Richard M. Daley that Vienna would leave the city if the plans for the condominium building were approved. Daley quickly rejected the project. Beukema said that the community began learning about other proposals for the site, including one for a movie theater complex and another for a public storage facility. But, she said, those proposals seemed to focus on filling the empty land rather than generating long-term, quality jobs. Laura Dresser, a labor economist with the Center on Wisconsin Strategy, said cities are often reactive when it comes to economic development, waiting to be contacted by businesses to avoid being accused of “picking winners.” The problem with this free-market approach, Dresser added, is that the companies most likely to have the resources to call are the same ones that offer high numbers of low-wage, part-time jobs. As the planning department moved forward in its search for a developer, residents soon realized that the community’s interests were being ignored. In response, community leaders drafted a concrete set of criteria they expected potential employers to satisfy. The document demanded the creation of 400 manufacturing jobs, a job training program, living wage and benefits for its workers, local hiring and environmentally sound business practices. The numbers seemed attainable based on the Local Economic and Employment Development Council’s analysis of the site. The community’s demands were closely aligned with the guiding principles behind an economic development theory known as “high road” job creation, a term coined in the labor movement of the 1990s. The strategy revolves around communities identifying available infrastructure, workers and resources and communicating with local government and businesses to ensure the training of low-wage residents for specific permanent jobs in high demand. In the end, communities avoid low-paying part-time jobs that promote economic stagnation, and businesses spend less time recruiting, reduce turnover and employ productive workers. The lack of communication did not discourage the community organizing effort. During five of those years, organizers visited City Hall every three months to speak with planning officials and to request a meeting with Daley. Their doggedness landed them one meeting with the mayor’s assistant, where they officially reiterated their expectations about the development project. After six years of campaigning, the Logan Square Neighborhood Association heard rumors that the city was considering a Costco Wholesale warehouse. After researching the corporation–”which made headlines at the time for paying entry-level workers $10 an hour, providing health coverage and creating as many full-time positions as possible–”the organization informed the city that it was onboard as long as Costco provided job training, Beukema said. The proposal offered fewer jobs–”between 100 to 150–”than the community had hoped for, but the quality of the jobs and the company’s attitude toward employees impressed them, according to Beukema. Longtime Lathrop Homes resident Pecola Doggett, a member of Beukema’s church, was juggling a series of temporary and seasonal jobs to support her family. “I felt real good because at that time I was looking for something permanent. I was looking for something concrete,” Doggett said in response to Costco’s plan. In 2000, Costco agreed to build a store on the property and provide job training to local residents. Between the time the deal was settled and when Costco started hiring, several community groups provided an eight-week job preparation program to prepare local residents for interviews with the company. Doggett completed the course successfully and landed an interview. She received an offer to work for the membership department, and she immediately accepted. Thirty other people who went through the training program were hired, and 80 percent of them were still employed at the end of the first year, according to store manager Brian Thomas and the Logan Square Neighborhood Association. The full-time, $10-an-hour position allowed Doggett more discretionary income to travel and enjoy concerts and art galleries. She has received pay raises since she was hired, and this February marks her 10th year with the company. Five others from the original group still work there, too. The owner is a “very blessed individual, and I thank God for him ’cause he [is] blessing all of us,” Doggett said. 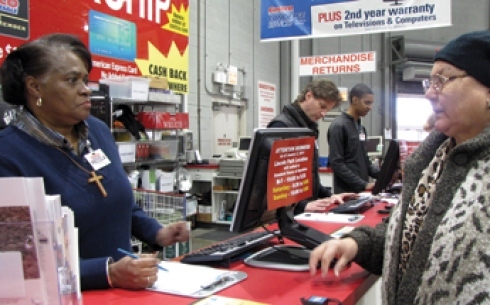 According to 2008 federal employment data, more than 90 percent of the 159 Chicago residents working on Costco’s block earned more than $15,000 a year. The location also hires locally, with 75 percent of its staffers living within five miles of the store, according to Thomas. “Wherever we open, we want to employ from that community and we want to give back to that community,” Thomas said. Both Doggett and Beukema are unsure why the city has not taken their case as an exemplar and courted more socially responsible companies elsewhere in the city.